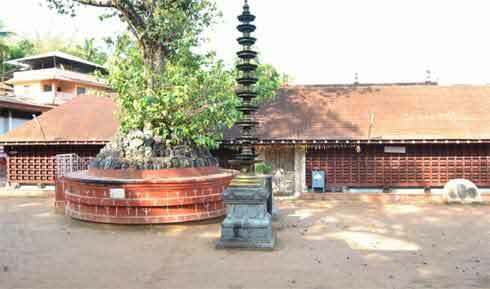 Anantheshwar Temple at Manjeshwar in Kasargod is dedicated to Narasimha, Lord Shiva and Subramanian. This is one of the oldest temples associated with the Gowda Saraswat Brahmins. The temple is around 1.5 kilometers from the Manjeshwar Railway Station and around 23 km from Mangalore. The main deities worshipped in the temple are Lord Shiva in Shivling form, Narasimha and Subramanian. The Subrahmanya murti here is associated with nagas and is known as Nagaroopi Subrahmanya. Narasimha is worshipped here as Sri Bhadranarasimha. The murti is flanked by Bhudevi and Sridevi. The subsidiary deities worshipped in the shrine are Sri Vittala, Sri Vedavyasa, Sri Laxminarasimha, Keshava, Sri Krishna, Karalanarasimha, Hanuman, Ganapati and Garuda. A unique aspect of the shrine is anthill Ruvvani or Rohini. It is believed to be the abode of Snake Vasuki. The main murtis worshipped in the temple are on the top the anthill. The sacred temple pond is known as Shesha teertha. The temple is an important center of Naga worship in the region. It is believed that nagas reside below the temple complex.